‘It’s not what you say, it's how you say it,’ right? Well, both points matter, though you have to know exactly in what way you should write killer content so that it appeals to its target audience. It’s still easy to get lost on the way from what you know to what you write. 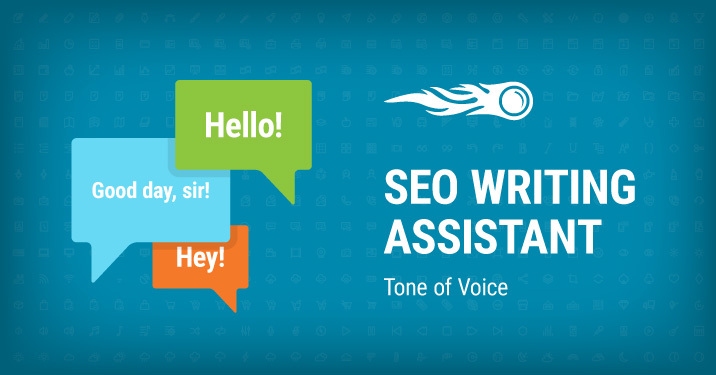 Our new feature in SEO Writing Assistant will solve this issue. It’s called Tone of Voice and it will help you understand how formal or informal your text is. The feature shows you exactly how you deliver your message, including the choice of words, their order, rhythm, and pace. It will also help you write consistently and ensure that there are no standalone words that would deviate from your preferred tone. This score is powered by a machine learning algorithm, based on scientifically proven research and thousands of human-rated pieces of text. You select your tone of voice and based on that we analyze your text. Remember that a carefully chosen tone of voice sets you apart from the rest, builds trust and is used to influence and persuade. 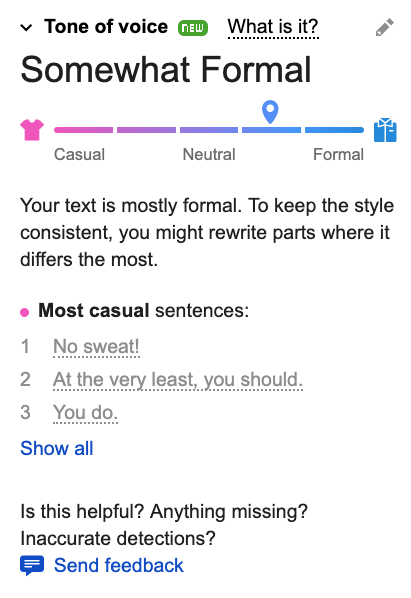 Please note that the feature works for the English language only. Now you’re good to go! Try out our new feature and don’t forget to share your ideas, comments and suggestions by emailing us at [email protected]. Stay tuned, as more updates are coming like a tidal wave!